9 上 Unit4 单元测试卷一、听力部分 （共 20 小题，每小题 1 分，计 20 分）A） 听对话回答问题。( ) 1. How do you learn about the world, Millie? A. B. C. ( ) 2. Who are they talking about?A. B. C. ( ) 3. What will Sandy like to use?A. B. C. ( ) 4. Which book is mentioned in their conversation? A. B. C. ( ) 5. Where will they go for a walk tomorrow?A. On the beach. B. In the park. C. In the countryside. ( ) 6. What will happen if the man keeps singing loudly?A. He will get tired. B. He will lose his voice. C. He will catch a cold. ( ) 7. Why does Amy want to buy the scarf?A. She thinks it is beautiful. B. It will be warm in winter. C. It is very cheap. ( ) 8. What is the woman looking for? A. A bookshop called Sunshine. B. A block of flats called Sunnyside. C. A shopping mall called Sunlight. ( ) 9. What has the man done many times before?A. He has swum across the river. B. He has jumped over the gate. C. He has climbed the tree. ( ) 10. How is Millie feeling?A. Maybe she feels nervous. B. Maybe she feels ill. C. Maybe she feels sleepy.听第一段对话，回答第 11~12 小题。( ) 11. From where can they see a long way?A. The bathroom. B. The balcony. C. The kitchen. ( ) 12. What does the man think of climbing the stairs?A. It is great fun. B. It is boring. C. It helps to keep fit.听一篇短文，回答第 13-15 题( )13. 听第一篇短文，回答第 13-15 题。请根据内容从 A,B,C 三个选项中选择正确的选项，完成信息记录表。听两遍。( ) 13. A. reading B. sun C. dark( ) 14. A. the sofa B. the supermarket C. the car( ) 15. 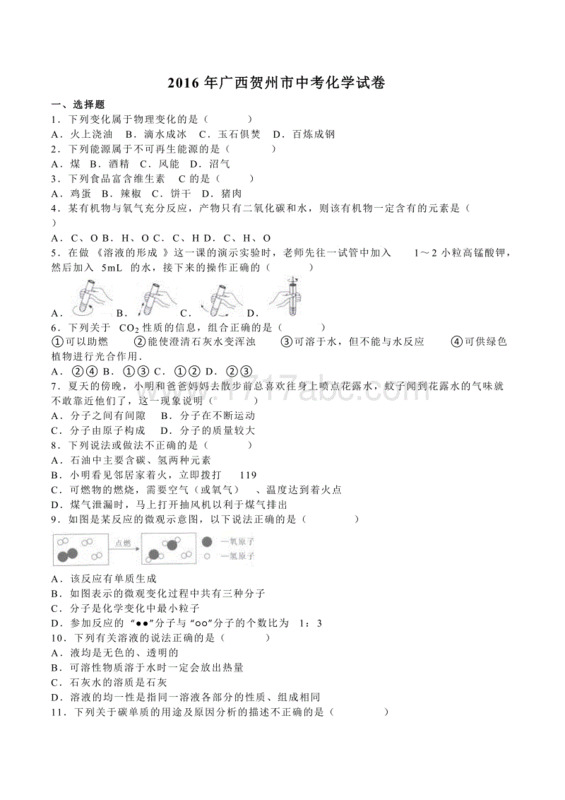 A. paper bag B. pocket C. shopping bag听一篇短文，回答第 16-20 题( )16. Which country is Emily visiting on vacation? A. France B. England C Japan( ) 17. Who is she going with?A. Her friend B. Her sister C. Her parents( ) 18. When is she leaving?A. In May B. In July C. In March( ) 19. What will the weather be like there?A. Cold B. Hot C. Neither too hot nor too cold( ) 20. What is she going to do?A. Go fishing B. Visit some friends C. Go swimming二、单项选择题（本题共 15 小题, 每题 1 分，共 15 分）( ) 21. —How do you know about the young boy standing over there?—Oh, I heard that he is _________ captain of a football team in_______ university in our city. A. the; the B. the; an C. /; a D. /; an( ) 22. —You know there is different weather in different places in China. It’s hotter in Hunan Province than In Jiangsu Province all the year around. —Yeah, it’s ______ hotter in Hainan Province than in Henan Province. A. much B. more much C. even more D. quite( ) 23. He did not made a careful preparation before the interview last week. ______, he failed to miss the chance to get the job. A. By the way B. As a result C. Tell the truth D. In fact( ) 24. —How is your grandpa now? Has he been better since he fell off the wall?—A little bit better, but he will have to _______ in hospital for at least two weeks. A. rest B, wait C. remain D. live( ) 25. When life gets hard and you want to _______, remember that life is full of ups and downs (起起落落), and without the downs, the ups would mean nothing.A. give up B. give off C. give in D. give out( ) 26. I heard that a great fire _________ when I was in a nightclub in Jintan last night. A. broke down B. broke out C. broke up D. broke in( ) 27. —I hear a number of girl students got lost or ______ hurt on their ways to colleges or universities this year. —Sorry to hear that. But our government _______ much to pay attention students’ safety.A. bad; did B. serious; is doing C. seriously; has done D. badly; will do( ) 28. —Why didn’t you try your best to get on the subway (地铁)? —I tried to, but it started moving _______ I could get on it.A. before B. while C. as soon as D. afterGrandpa’s GlassesWhat Grandpa has a pair of 13 glasses.Where He often leaves them in 14 .How They often drop out of his 15 . ( ) 29. In England, people often take umbrellas when they go out in the morning because the weather there is very changeable at this time of year. Now it’s fine, but after a short time it may be rainy. The underlined word “changeable” means ______ in Chinese. A. 更新的 B. 常变化的 C. 多晴的 D. 多雨的( ) 30. These days, many graduates(大学毕业生) usually have to have quite a few interviews to _______ a job that they need to take. A. try on B. try out for C. try D. have a try on( ) 31. Although his family _______ not very rich, but quite happy. Look! His whole family ___________ TV together in the room happily. A. are; is watching B. are; watch C. is; watches D. is; are watching( ) 32. I’m sorry hear that over ten policemen died _______ the bombing in the Tianjin Bombing(爆炸), but later still more died ________ the diseases after the quake in Ya’an last year.A. of; of B. from; from C. of; from D. from; of( ) 33. —What interests you most in today’s newspaper? —Two European and American football teams will play three games, including one ________ Evergrande Club (恒大足球队) the day after tomorrow. A. with B. against C. on D. in( ) 34. — Do you know the result of yesterday’s football game? — Yeah, our team won again and there was _____ excitement just before it ended. A. a large number of B. a great deal ofC. very D. quite( ) 35. —Could you help me put up the maps on the wall? —______________. I’ll do it for you right away. A. That’s all right B. I hope so C.No problem D. That’s right三、完形填空（本题共 10 小题，每小题 1 分，共 12 分）阅读下面短文，掌握其大意，然后从所给的四个选项中，选出一个最佳答案。Do you want to be successful in everything you do? If so, then 36 ? Here is an example. There was a farmer who grew corn all his life. Each year he took his corn to the market. Then each time his corn was chosen as the 37 and won the first prize. One year, a newspaper reporter interviewed him and learned something 38 about how he grew it. The farmer offered his seed (种子的) corn to his neighbors. “How can you share your best seed corn with your neighbors?” the reporter asked. “You know they are taking part in the 39 with you each year.”“Why, sir,” said the farmer, “didn’t you know? The 40 picks up pollen (花粉) from the corn and moves it quickly from field to field. If my neighbors grow 41 corn, cross-pollination (异化传粉) will influence the quality of my corn. So if I want to grow good corn, I must 42 my neighbors to grow good corn.”The farmer knows much about the connection of life. His corn cannot improve 43 his neighbors’ corm doesn’t improve.As a great man says, “We make a living by what we 44 ; we make a life by what we give.” We can’t live without food, clothes and many other things. However, a meaningful life is not decided by how much we can get, 45 by how much we can give others. Giving, instead of taking, makes us 46 from other animals. So those who choose to live well must help others to live well and those who choose to be happy must help others to find 47 in their life. ( ) 36. A. why B. how C. when D. where( ) 37. A. cheapest B. prettiest C.best D. shortest( ) 38. A. popular B. serious C. terrible D. surprising( ) 39. A. game B. fight C. experiment D. competition( ) 40. A. wind B. water C. farmer D. neighbor( ) 41. A. tasty B. bad C. tall D. unusual( ) 42. A. teach B. remind C. help D. require( ) 43. A. if B. though C. because D. when ( ) 44. A. do B. own C. get D. grow( ) 45. A. And B. But C. Or D. So( ) 46. A. different B. free C. safe D. far( ) 47. A. hope B. success D. friendship D. happiness四、阅读理解。从每题所给的四个选项中选出最佳答案。 （本题共 10 小题，每小题 1.5 分，共 15 分）AAn old English saying goes, “Laughter is the best medicine.” One person who certainly would have agreed with this is Norman Cousins. Norman Cousins was the editor of a magazine called “Saturday Review” for a;most forty years. He also wrote and spoke about world peace and anti-nuclear (反核的) and anti-war issues (问题). And he traveled to many different countries to share his ideas. In the 1960s, after returning to the United States from a busy and tiring trip to Europe, Mr. Cousins got sick. He discovered he had a rare disease, known as ankylosing spondylitis, which caused the joint between his bones to stiff (僵硬的).In less than a week after he got sick, he could not stand. Every move that he made was painful. He was not able to sleep at night. The doctors told Mr. Cousins that they did not know how to cure his illness and he might never get over (摆脱) it. Mr. Cousins, however, refused to stop hope. Mr. Cousins thought that illness could be caused by unhappy thoughts. He did not want to take medicine to cure himself. Instead, he felt that happy thoughts or laughter might cure his illness. He began to experiment on himself while still in that hospital by watching comedy (喜剧) shows on TV. Mr. Quickly found that ten minutes of real laughter during the day gave him two hours of pain-free (无痛苦的) sleep at night.Deciding that the doctors could not help him, Mr. Cousins left the hospital and checked into (入住) a hotel room where he could continue his experiments with laughter. For eight days, Mr. Cousins rested in the hotel room watching comedy show on TV, reading amusing books, and sleeping whenever he felt tired. Within three weeks, he felt well enough to take a holiday to Puerto Rico where he began running on the beach for exercise. After a few months, Mr. Cousins was able to carry on his work. He had laughed himself back to good health. ( ) 48. What is the main topic of the passage? A funny story. B. An interesting cure.C. An amazing life D. Why people laugh. ( ) 49. What is NOT true about the underlined words “ankylosing spondylitis”? A. It is uncommon. B. It makes walking difficult.C. It is easily cured. D. It is painful. ( ) 50. What did the doctors think about Mr. Cousins’ disease? A. It could be cured if he slept more. B. It might be cured. C. It could be cured by taking medicine. D. It would take a week to get over it. ( ) 51. What did Mr. Cousins think cured him? A. Laughter. B. Running on the beach.C. Medicine. D. Taking a holiday. ( ) 52. What did Mr. Cousins do after he got better? A. He went back to the hospital. B. He continued his job.C. He wrote amusing books. D. He went on relaxing by taking a holidayBIdioms (习语) are phrases and sentences that do not mean exactly what they say. Even if you know the meaning of each word you see or hear, you may not understand the idiom because you don t understand the culture behind it.For example, if an American boy asks his mother what s for dinner tomorrow, she may say“I ll play it by ear”, that means she doesn t have plans for dinner and she will decide later.“Play by ear”used to mean playing music using the sheet music, but now people often use it when they re not talking about music.There are many idioms in English. If you learn to use them, your English will be more vivid and colorful. English idioms are more common in spoken English. They can be difficult to remember sometimes. Next time when you hear somebody saying to you, “Give me a hand”, you don t necessarily stretch out your hand to him/her, but you do need to be helpful. And when the situation is out of hand, you usually can do very little to manage all that. What about a green hand? It s not about the color of your hand! You re a green hand when you are very new at your work and don t have much experience. If you and your partner always work together hand in glove, you two definitely work together very well.Can you guess the meanings of some common English idioms to do with parts of your body? ( ) 53. An idiom is _______.A.a phrase or a sentence that means exactly what the words sayB.a phrase or a sentence that doesn t mean exactly what every word saysC.so difficult that nobody can understandD.something to do with parts of your body( ) 54. If a mother says“I ll play it by ear”to talk about the dinner, she means _______.A.she will cook dinner while listening to music at the same timeB.she doesn t hear what others are talking about.C.she will play music using the sheet music instead of cooking dinnerD.She doesn t have plans for dinner and will decide later( ) 55. When one says“Can you give me a hand?”, he means _______.A.he needs to hold your hand. B. he works well with youC.he needs your help D. he is a new comer and can t help with the situation( ) 56. Which of the following is NOT true according to the passage?A.People use English idioms more in spoken English than in written English.B.To understand the culture behind an idiom is important in understanding the idiom.C.Idioms make your English more vivid and colorful so they are easy to remember.D.You may not understand an idiom even though you know the meaning of each word. ( ) 57. Here are 4 common English idioms to do with parts of your body and their meanings. Can you match (匹配) them?1)to learn something by heart a. to depend on oneself2)to have sticky fingers b. to know something very well3)to stand on one s own feet c. to do something secretly4)to go behind someone s back d. to have the habit of stealingA. badc B. bdac C. cbad D. cdba四、阅读表达（共 5 分，每小题 1 分）阅读下面短文，并根据所读短文内容在文章后的空格里填入一个最恰当的单词。In Britain, people have a strange hobby. Whenever there is a Bank Holiday weekend, a certain (某个) kind of shop always gets very busy, and it’s not what you might think—clothes shops or music shops. The British people go to DIY stores and garden centers. Large numbers of people spend their days doing home improvement (改善) instead of relaxing. Ding DIY is very popular in Britain, and there are lots of DIY programmes which show people how to improve their homes. Some people just do some simple decorating—putting up wall-paper and painting walls. There are all kinds of DIY projects that some people decide to do, like laying a new carpet (地毯), tiling (贴瓷砖) walls or putting in a new shower. Unluckily, some people start doing a job which ends in DIY disaster. For example, electrical things should be done by a special worker, but many people don’t care about this warning and putting themselves in danger. Gardening is also popular, and a good way to enjoy the weather on a sunny Bank Holiday. But it’s not as simple as planting plants and doing some watering. More difficult work such as building a new garden or some decorations can cause backache.So why do people do it? Who knows? Maybe they are so used to working that they are not very good at relaxing. One thing is for sure, though a lot of DIY or gardening projects will be started with the best plans, many of them may not get finished. Bank Holiday DIYThe things British people like doing at the Bank Holiday weekend They go to DIY shops and garden centers. The do some simple 58 like putting up wall-paper and painting walls. They do some 59 on a sunny Bank Holiday.The problems that the British people have when they DIY They may put themselves in danger when doing some 60 things.  They may not 61 the DIY or gardening projects which are started with the best plans.The reasons why DIY is popular The British people may like 62 better than relaxing.58.